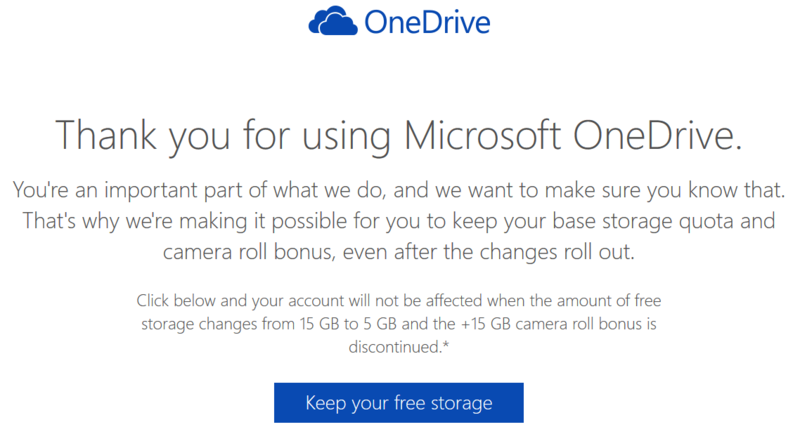 In November 2015, Microsoft made the decision to reduce the free storage space enjoyed the Microsoft OneDrive users from 15GB to 5GB, and discontinue 15 GB camera roll storage bonus. The worst part is it, the cut affects both existing and new OneDrive users. The decision understandably sparks criticism and anger of OneDrive users, especially those who managed to enjoy more than 30GB, 35GB or 50GB of free disk space due to various promotions such as camera roll bonus and referral bonus. Microsoft later partially backtracked and reversed on its OneDrive cutback decision after backlash from OneDrive users, allowing OneDrive users who have already grabbed more than 5GB free cloud storage space to being grandfathered to maintain and keep their current quota. The caveat is that the retention of 30GB free OneDrive cloud storage space is not automatic. You must act manually to keep the base storage quota of 15GB and camera roll bonus of 15GB after the changes roll out. Thank you for using Microsoft OneDrive. You’re an important part of what we do, and we want to make sure you know that. That’s why we’re making it possible for you to keep your base storage quota and camera roll bonus, even after the changes roll out. Click below and your account will not be affected when the amount of free storage changes from 15 GB to 5 GB and the +15 GB camera roll bonus is discontinued. Click or tap on the keep your free storage button. You need to sign in to your Microsoft Account to claim the grandfathered OneDrive free storage space. You must claim the deal by 31st January 2016. Your account will not be affected by the upcoming storage changes. If you don’t have OneDrive account yet, sign up before 31st January 2016 to get free 15GB base storage with optional 15GB camera roll bonus for free, as Microsoft is still reducing the free storage space offered to new OneDrive users. Starting from February 1st, 2016, all new OneDrive account comes with 5GB free base storage space, and camera roll bonus is no more. If you don’t sign up for the retention of 15GB or 30GB OneDrive free storage space, and you store more than 5GB of data on OneDrive, you will receive free one year subscription of Office 365 Personal, which includes 1TB of storage. In addition to reduction in free storage space for personal OneDrive account, the unlimited storage space for Office 365 Home, Personal, or University subscribers is also reduced to 1TB. If you have stored in excess of 1 TB, you will be notified of this change and will be able to retain your increased storage for at least 12 months. More information can be found at the FAQ. The changes signifies the change of focus for Microsoft, which places its future on the revenue from cloud services.